Ground Level explores how contemporary art practice, mapping and cartography collide. Traditionally the role of the cartographer has been to provide a geographically precise description of the landscape. However, rarely has it been a wholly objective enterprise. While technology increasingly grants access to the precision of satellite imagery, the cartographer’s work has moved further from the ground into more contested areas such as ownership, rights to land, and the flows of people. This exhibition brings together international artists who perform their own personal forms of cartography. The resulting works suggest maps and surveys, but rather than portraying a singular worldview they put forward idiosyncratic readings of language, peoples and signs, as well as geography. The exhibition is curated by Kit Hammonds, winner of the 2010 Hayward Curatorial Open, a platform for innovative curatorship in the UK. Artists include: Maria Thereza Alves; The Atlas Group; Ricardo Basbaum; Heath Bunting and Kayle Brandon; Center for Land Use Interpretation; Simon Evans; Yolande Harris; Christian Philipp Müller; Eyal Weizman; Stephen Willats. 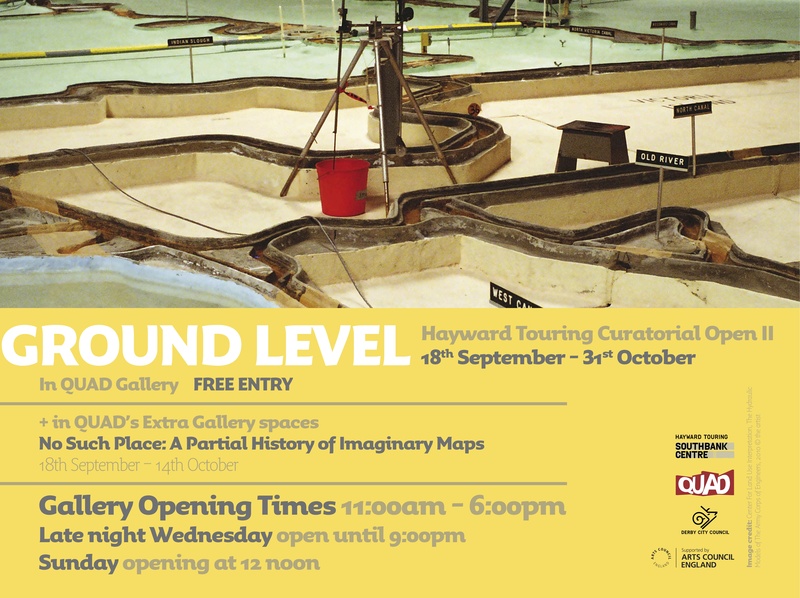 Ground Level is a Hayward Touring exhibition selected and developed in partnership with John Hansard Gallery; QUAD, Derby; Oriel Mostyn, Llandudno and Leamington Spa Art Gallery & Museum. Click here to see a video interview with Curator Kit Hammonds. Ground Level accompanies the second Hayward Touring Curatorial Open exhibition devised by writer and curator Kit Hammonds. This limited edition publication features work by Maria Thereza Alves, The Atlas Group, Ricardo Basbaum, Heath Bunting with Kayle Brandon, Center For Land Use Interpretation, Simon Evans, Yolande Harris, Christian-Philipp Müller, Eyal Weizman and Stephen Willats. It also includes an illustrated essay by Hammonds exploring the way in which mapping relates to contemporary visual art as an experiential process that requires a direct relationship with the landscape, geography and people. Exhibition copies feature a specially produced Risograph facsimile of Island Time by Simon Evans. Ground Level is published by Hayward Publishing and is available in all good art bookshops and at QUAD during the exhibition.